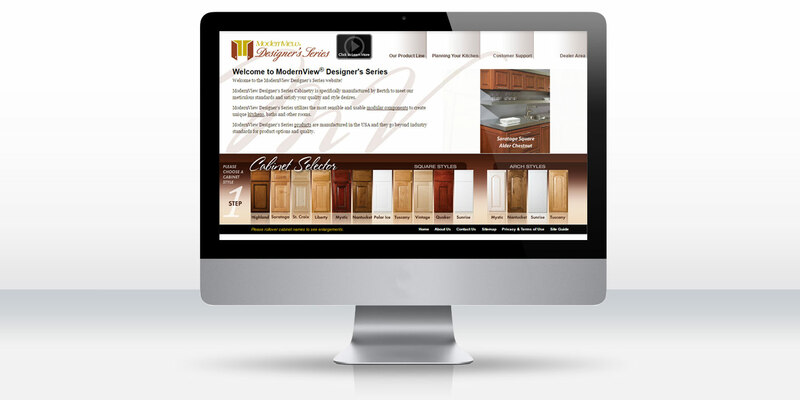 Customize cabinets in three easy steps with the selector tool DDA programmed for this website design. ModernView® Designer’s Series is a cabinetry line specifically manufactured by Bertch to meet ModernView’s meticulous quality and style standards. This exclusive product line includes more than 15 distinct cabinet styles, which are available in a variety of wood types and finishes. The challenge in marketing the cabinetry line online was to present all available choices to the customer, so that he/she would be able to see how easily an amazing custom look can be achieved. While the website would be developed for public access and general consumer viewing, ModernView Designer’s Series is sold through a network of dealers based throughout the United States. So, it was important to have an area of the website primarily devoted to dealers. With a dual target audience in mind, additional objectives were set forth for the website design and development project. All specification information, such as door frame dimensions, and available upgrade options needed to be clearly identified. ModernView wanted to provide users with information on how to measure kitchens with different layouts, appliances, molding, accents, and lighting. If general consumers visited the website, ModernView wanted a way for them to find a dealer in their area. Dynamic Digital Advertising (DDA) designed the ModernView Designer’s Series website to complement an existing branding identity and showcase the full line of cabinets in a unique and engaging way. DDA programmed a cabinet selector tool that allows users to customize their cabinetry in three easy steps – door style, wood type, and finish. At the end of the tool, users can select from a large assortment of accessories, hardware, upgrades, glass panels, and other options. Throughout the selector tool and website, there are contractor beauty shots that display the cabinet door styles in everything from a traditional, Tuscany kitchen to a modern, urban design. For consumers, DDA programmed a dealer locator tool that allows users to search by state or zip code and find the names and contact information of dealers in their area. For dealers, DDA programmed a password-protected area of the site that includes a link to an industry intranet, order forms, pricing information, a discussion board, and much more. DDA developed the ModernView Designer’s Series website so that it is scalable, and since its launch, as the line of products grows, so does the website. Also, as ModernView’s network of dealers expands, site administrators are able to add and edit dealer contacts through a back-end system programmed by DDA. Not only does the site serve as a great marketing tool on its own, but dealers are able to utilize the selector tool in their showrooms to guide customers through the buying process.